Hello, I hope you are having a wonderful week! Today I have a card to shoe you that I made for the Southern Ridge Trading Company Blog. I used Flourish FLO-009 from the Southern Ridge Trading Company Store. I used my Go-Kreate dies and scrap paper to create the card base. My image is colored in Copics. 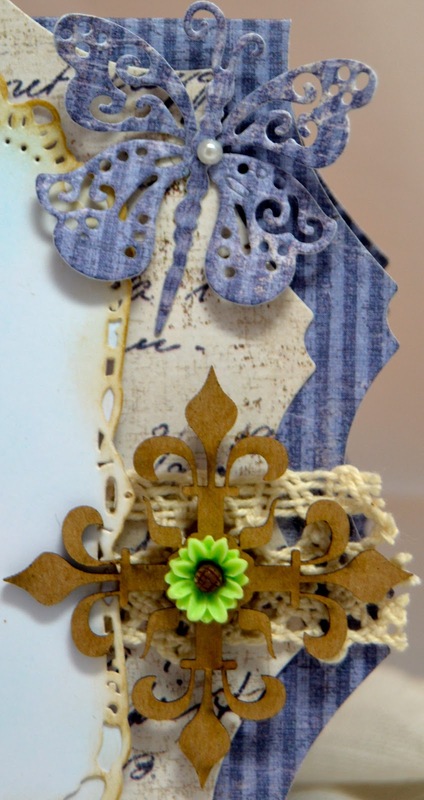 This is the Flourish chipboard in its natural color and I mounted a resin flower onto it. Here is the other flourish I tucked into my floral arrangement. The flourishes come in a set of 5. Thank you for stopping by and I hope you enjoyed my card. Gorgeous card Kelly and your coloring is beyond compare. Your design work is wonderful and I love that butterfly. Do you know where you are moving to yet? You must have a thousand things to do. What a beautiful card. Your coloring is fantastic. Lovely design and details. Glad to see you have some time to craft. Thinking of you !! Kelly, I love how you colored this cute image, especially the hair! Gorgeous design and embellishments as well. Your card is beautiful!!! I just love the flowers and butterflies! And your coloring is fantastic!! I love this one - colour palette right up my street, and that wonderful delicate hydrangea colour especially on the corrugated card. The image is an absolute delight, and exquisitely coloured as always, Kelly.